Purple Plum Fairy: Why I Love to Exercise Over Fad Diets? Have we totally forgotten what it's like to be active? Let me share with you my story: If you've been reading my blog entries mid of last year, you probably know that I went into some "ideal happiness" protein diet. For about two to three months, believe it or not, I really lost weight. I lost about 15-20 pounds. It was a strict diet which instead if making me feel good about losing weight made me felt I was about to go insane. I almost went totally ballistic because instead of asking how I was doing, I'd too often be asked "How much do you weigh now?" And if you have been on a diet and you hadn't eaten "normal" foods for quite sometime you tend to be cranky, sensitive, and gets easily annoyed even with the smallest things. You couldn't blame me--at the time I've only been eating greens and those stupid little 'ideal diet foods' that could easily pass for either some baby food or dog food! During the time, I was so focused more on "losing weight" without necessarily thinking of my own safety. To make the long story short, I ended up saying goodbye to that diet program. And since I bid that thing buh-bye, I had been so happy to finally be free. I may not have lost that much in terms of my ideal weight, but I know I'm doing it the proper way this time--through exercise and leading a healthier and more active life. 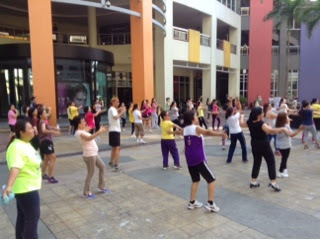 I love doing Zumba now because it releases endorphins--the so-called happy hormones. Sweating it out makes me feel good. It might take me years to get my desired weight, but at least, I no longer have to worry about how my kidneys or liver would react, or that I need not eat baby or dog food like anymore. I'd not have problems on dealing with my mood swings anymore because I won't be feeling so "stressed about losing the weight." Exercise in itself makes me happy. Of course, there are still times when I'd feel a bit lazy about moving my butts off, but then I'd like to think it's a pretty normal thing. And that's the best thing that this whole 'fad diet' thing had taught me--any fad diet is simply just that--a fad--meaning it is something that you can do only for a limited time. It may work for a while but it is not something that you can do for the rest of your life! But in this life, it is an active lifestyle that you can sustain and further improve. I've learned through time that exercise is best done with either a friend or an exercise support group. Be it a sport you love (in my case, it's badminton), or running, brisk walking, circuit training or Zumba--as long as you do any activity with a buddy (yes, even with your favorite dog will do! )it's going to be a part of your lifestyle, leading you towards good health. Now, you might say, "I don't have time for exercise or any physical activity because of work." Well, I'd say, it is simply a matter of priorities. For those working professionals, there are weekends---where one usually have time to do things apart from office work. Squeeze at least 30 minutes of your time each day from your workload and start moving. Have you guys heard of The Steps Project? If you've been following my blog, I've written about this initiative from a group of friends that aims to lead people towards leading a more active and healthier life. We've been often told that we must take 10,000 steps a day, right? That's exactly the goal of The Steps Project. It gives one an opportunity to become healthier by means of being active and gain a community of support groups as well. It's the first of its kind, the more people who join The Steps Project, the more people will benefit to the said program, the healthier people we'll be able to save from diseases. If you're interested with The Steps Project, visit their website at www.thestepsproject.com or like them on Facebook at http://facebook.com/thestepsproject for more details. There will be an Activity Fair this coming May 18,2014 at the University of the Philippines, Diliman (UP Oval) from 5:30AM-10AM. Pre-registration is now ongoing. Just pre-register online at the website given above or you can also go to the day of the event for on-site registration. Fee is Php350 which includes The Steps Project shirt, access to the Fair and other freebies. There's a lot in store for you at The Steps Project Activity Fair. I do hope to see you there! I totally support groups like The Steps Project because according to a research I've read at the University of Pittsburgh School of Medicine, those who wants to lose weight who have the support of loved ones are more likely to shed pounds than those who attempt to slim down solo using a specific diet. "Having people around who support your efforts will help sustain them--true friends reinforce positive, healthy changes," says Elisa Zied, RD. Author of Feed Your Family Right.